I had a couple of people ask me how I got the heart shapes in some of the recent snowflakes. For those who haven't seen these before, they're called dimpled rings and they aren't that hard to make. Dimpled rings are usually larger rings, and it's easier to work them if you tat a little bit looser than normal. The first ring in this picture is a standard ring of 10-10-10-10. 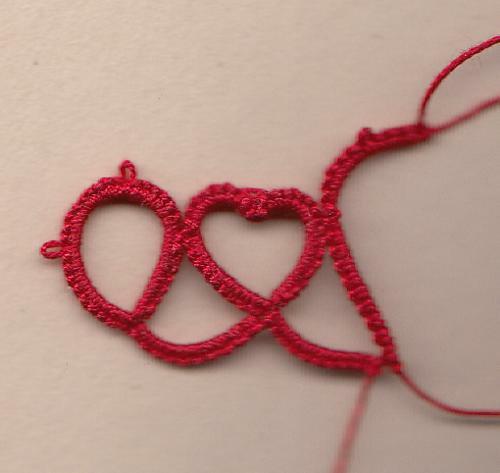 The dimpled ring starts out the same way, 10 stitches and a join, Then it's 6 stitches for the "bump" of the heart and a small picot. Make sure to keep the picot small or the dimple will spread out too much. 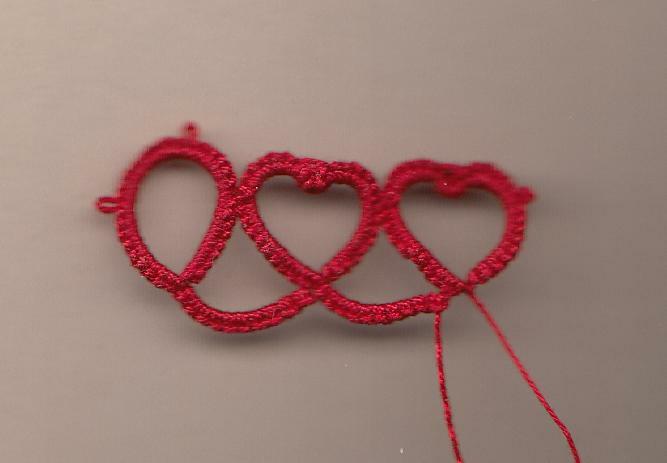 The dimple of this ring is 4 stitches, folded back on themselves when you do the join into the small picot. 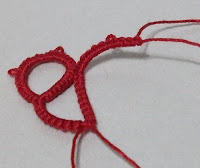 Make sure to keep the picot small or the dimple will spread out too much. 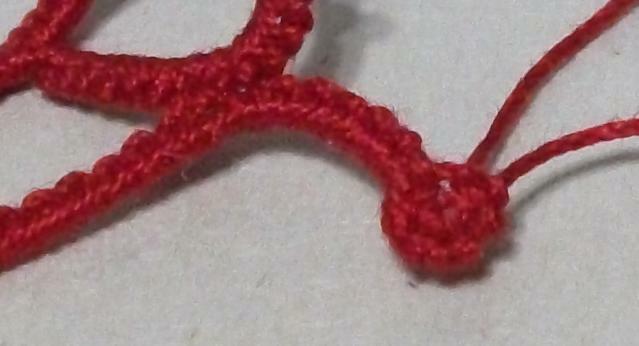 The dimple of this ring is 4 stitches, folded back on themselves when you do the join into the small picot. The picture above shows the join being made. The next picture shows what it looks like right after you do the join. Rings can be tight and hard to close under normal circumstances. 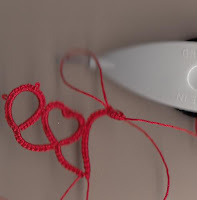 A ring folded back on itself can be even harder to close, so I usually pull the thread to close the ring a little and open it a little at this point, just to make sure that the core thread will slide. Then finish the ring with 6 stitches for the second bump and 10 stitches to finish it off. Then close the ring like normal. See? Dimples aren't they cute? Just normal rings with attitude.